The company's revenue from oil product reloading at Klaipeda and Subacius oil terminals went down 27.9% to 3.1 mln euros. 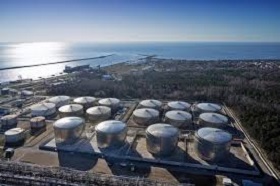 The LNG terminal's revenue dropped 16.4 % to 5.6 mln euros, Klaipedos Nafta reported via the Nasdaq Vilnius Stock Exchange. In January, Klaipedos Nafta reloaded 626 thousand tons of petroleum products at Klaipeda and Subacius oil terminals, down 19.3% from 776 thousand tons a year ago. The overall result in loading volumes for January was mainly affected by lower quantities from ORLEN Lietuva refinery and by lower transshipment quantities of heavy oil products transit. The LNG terminal re-gasified and reloaded 471 thousand MWh of natural gas, up 79.1% from 263 thousand MWh during the same period of 2018. The State of Lithuania own 72.32% of Klaipedos Nafta, and the remaining 10.41% belong to the Achemos Grupe business group. Klaipedos Nafta's stocks are quoted on the Nasdaq Vilnius Stock Exchange's Main List.